Over the years I have built a lovely little collection of ornamental perfume bottles which I have either bought from small gift shops or been given as gifts. I love the glamour and glitz of these bottles and last year I thought about creating some perfume bottle designs of my own in cross stitch. 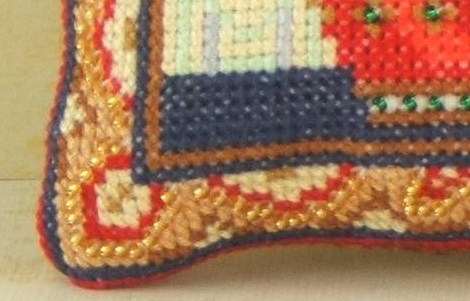 I wanted to produce rich ruby red and sapphire blue bottle designs and as I started sketching I had a further idea to create a cross stitched perfume bottle that could be backed with fabric, filled with stuffing, and made to stand up on a card base. I used graph paper and coloured pencils to sketch out the two bottle designs and while planning how to make up a finished bottle I realised the neck of the bottle would need to be wide enough to allow for turning it inside out and to put stuffing inside. This was my first and only attempt! It was very tricky making up the bottle, I think because the size was rather small, and it didn’t look too impressive either! Certainly not how I had pictured it in my mind. So, I scrapped the stand-up bottle idea and started working on a perfume bottle picture, taking the red bottle design and adding a background. But once I had stitched the picture, again it did not look right. For a start, where the bottle stopper and neck were enlarged for the stand-up bottle it looked very much out of proportion as a stitched picture. And even the background did not really suit the opulence of a rich red and gold perfume bottle. The ideas were just not working out how I had pictured them in my mind so I resigned the sketches and stitched pieces to a box file and put it in the cupboard for several months. 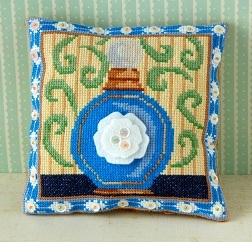 Just a few weeks ago the idea of cross stitched perfume bottles rose again and this time my plans were much clearer. I knew I still wanted to use the main body shape and pattern of the perfume bottles I had previously designed but that I needed to re-shape the necks and stoppers. I remembered the reason that I liked my collection of perfume bottles so much and that was because of the shiny gold and glittering stones so I needed to ensure my cross stitched versions featured such glamour too. I achieved this by working seed beads into the designs, both within the bottles themselves and also in the borders edging the designs. 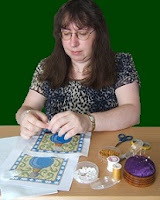 A lot of pattern and colour was added into the borders and also into the wallpaper designs behind the perfume bottles. I made the finished designs into square ‘tile’ shapes and although they could be framed as individual pictures I wanted to keep to my speciality of making my designs into mini cushions for dotting around the home so I added some luxurious gold velvet as the backing to these little cross stitched gems. My next perfume bottle design was going to be larger than this set of 3 and I wanted to incorporate more embellishments so I looked around my craft stash and found some pearly white sequins and white felt. Ideal materials for adding to an electric blue bottle. I cut out a double layered flower from the felt and sketched the cross stitch design around it, making a border which included the sequins topped with gold seed beads. My aim was to create a collection of designs full of rich colours and pattern with the added glitz of shiny beads and embellishments that would add a touch of glamour to any dressing table and I believe I have at last fulfilled that wish. This is a collection of designs that I am very proud of and one which I plan to grow with the addition of more perfume bottles, each incorporating combinations of seed beads, sequins and felt flowers.